This is very beautiful and warm picks. So bright and full of energy! Thank you for adding my bracelet to your mood board. Orange is the most invigorating colour, dontcha think? 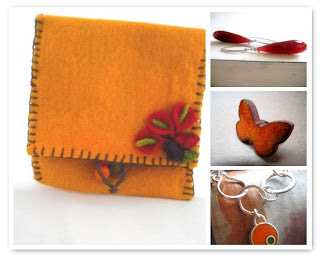 thank you very much for including my butterfly ring..
Great orange colors, I wish they bring energy to your week as well. Take care! I love your selection...beautiful orange colors! Wow,so beautiful collection with cute colors!